Is your company appropriately serious about Facebook? Facebook’s sweeping changes to the “Pages” function last March has made the popular social network much more viable as an interactive, satellite online presence for brands. Some companies are even using Facebook as the core of their social media strategy, and Vitamin Water and others are tagging their TV spots with their Facebook URLs, not their corporate Web sites. The opportunity (and perhaps necessity) of interacting real-time with fans on Facebook, and the ability to implement limitless applications has made Facebook presences for companies a top of considerable interest. Oh yeah, there’s also this little thing about Facebook having more than 200 million members. To help businesspeople (and even PR firms), navigate the potential of Facebook, two respected organizations have recently published free ebooks. I recommend that you download and read both ebooks (each a quick read at fewer than 25 pages with a lot of graphical examples). Both are excellent, but for entirely different reasons. “How to Use Facebook for Business” takes a linear and comprehensive approach to Facebook education, helping new users navigate account set up, invite friends, and so forth. If you’re not on Facebook, or joined a while ago and have a mostly-dormant account, the first section of this guide will be a huge help. Hubspot also covers the increasingly important area of applying different privacy settings to different people, and creating friend lists (business colleagues, high school classmates, people on whom you want to seek revenge, etc.). The guide also provides step-by-step instructions for creating a Facebook Page for a business, and if you’ve not yet set up a page for your company, it’s easy to follow advice. While Facebook Groups have fallen out of favor somewhat not that Pages for business is powerful and flexible, the Hubspot ebook includes the clearest comparison I’ve seen on the advantages of Groups vs. Pages. 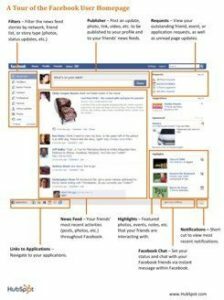 Three pages are also devoted to Facebook advertising (which I very much recommend for its low cost and targeting capabilities), and Facebook’s revamped and excellent reporting features for Pages. Facebook is not and cannot be a digital Yellow Pages ad for your company. You need to interact with your fans, and the opportunities for doing so are widespread and exciting. I learned a lot from this ebook, and if you’re ready to ramp up your corporate Facebook presence, read it today. The Advance Guard does an excellent, thorough job in juxtaposing the tabs on Facebook Pages as Web site navigation, and discussing how many tabs are possible (10), and the options for reordering them. An interesting point that I had forgotten is that each tab has its own URL, useful for promotions and tracking. The guide includes significant coverage of The Wall, and has a killer, concise tip: “Think like a blogger, not an advertiser – try to unfold stories over time, rather than blasting out messages.” Great advice. The Advance Guard – and its co-founder CC Chapman (whom I interviewed recently live on Twitter), are big proponents of photography, and they devote a section of the ebook to advanced photo usage on Facebook. 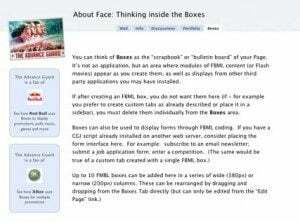 One area where a step-by-step approach might be useful is in the overview of FBML and boxes. FBML (Facebook Markup Language) is the code used to create and place custom objects on Facebook pages. It’s similar to HTML, but has some of its own vagaries. Excellent coverage in this ebook on the power of FBML and the ability to place up to 10 elements on the boxes tab, but a code level walk-through would be even more useful. A very interesting tip that I’d never considered is the potential to use applications to populate the Wall and interact socially, but not including that application on your Page. The “About Face” ebook also includes links to 16 Facebook Pages, each with a meritorious use of a particular element or application. Extremely useful to see these best practices in action. I recommend both of these ebooks, but before you read them, make sure you have a clear understanding of WHY your company is on Facebook, and what you’re trying to achieve. Like all things social media, Facebook advice can get you thinking tactically, losing sight of the big picture. The result is often an inconsistent, murky approach as you whipsaw back and forth between company social media “initiatives.” (not knowing your strategy also makes determining ROI impossible). What’s the #1 question you have about Facebook for business? Ask in the comments, and I’ll ask Hubspot and The Advance Guard to answer them in a future post.